Strictly speaking there is no actual boundary that space begins and our atmosphere ends. To gain your astronaut wings you need to travel about 100km straight up (or only 80km if you want the US award) and cross the Kármán Line. In relation to the radius of the Earth, which is over 6,000 km, this distance appears insignificant - the same as taking the car from Stratford to central London. Yet we are constrained to live within a relatively narrow band of our atmosphere for, without some sort of breathing aid or acclimatization, we struggle when climbing from sea level up a mountainside a few kilometres in height. So, it would seem very logical to enlist the help of robotic machines to carry out tasks beyond our comfort zone. This is exactly what the telescopes in the Las Cumbres Observatory Global Telescope Network have been designed for. It is a private non- profit making organisation that alongside its educational partner, The Faulkes Telescope Project, allows amateur astronomers, students and community groups to use high quality telescopes to study the night sky. To tell us about the working and future plans of the worldwide project was David Bowdley their Educational Director. At present there are two robotic telescopes: Faulkes Telescope North and Faulkes Telescope South. 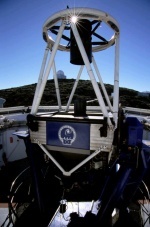 The `North´ telescope is sited 10,000 feet up on the island of Maui (the second-largest of the Hawaiian Islands). The `South´ telescope is at Siding Spring Observatory in New South Wales, Australia which is located in the Warrumbungle Mountains roughly 4,000 feet above sea level. Both telescopes are reflectors with a primary mirror 2 metres in diameter and are housed in automated observatories that fold back like a clam to reveal each telescope. They use CCDs to take pictures just like a modern digital camera and have a number of optional filters to bring out the best view of an object in the night sky. Having two telescopes on opposite sides of the globe in different hemispheres means that observations can be varied and carry on, in theory, 24 hours a day. Also, their longitudinal placement means that European schools can use them during the school day but most students work on saved images that they have requested previously or in the archive on the Faulkes Telescope website. There are ambitious plans to grow the network of telescopes by adding clusters of 4 smaller Meade telescopes at six sites across the globe. The first cluster will be sited near the Faulkes Telescope South in Australia in early 2008 followed by another cluster next to the Faulkes Telescope North. Meanwhile there is also the National Schools´ Observatory which is free for UK and Irish schools and you register online at http://www.schoolsobservatory.org.uk. This organisation uses the Liverpool Telescope, which was the prototype for the Faulkes North and South telescopes. It is situated on the island of La Palma in the Canary Islands about 7,800 feet above sea level on top of an extinct volcano.